It was only supposed to be a one-time thing. And yet here you are, waking up next to the same half-stranger in your bed once more. Let's keep this to a two-night stand, they'll tell you, half-asleep on their side, propped up with a mixture of sleepiness and sheepish grin. And after a bit of a struggle, they'll find their pants and shuffle out into the hazy, moonlight-streaked sky. Lightning may have struck twice, but surely that's it? You stare into the melancholy dawn before getting going, to do "this and that" as you head through the hustle and bustle, yet you cannot shake the thoughts from your mind. It turns out that it isn't. You keep running into your non-insignificant other, someway, somehow. And it doesn't help when they propose making a commitment to your recurring habit of one-night stands. They're ready and willing, but is it really what you want? Even when it's long stopped feeling good, something compels you to keep going. Bars flash across the screen obfuscating your view, troubling you as the line blends between reality and imagination, leaving you unsure of what to think or do. But maybe, if you can navigate through the bleakness of black and white long enough, you will find something else. A friend, a splash of color in the otherwise foreboding shadows of the world suddenly appears. Will you try to show her what's really going on? Or do you hide behind façade, unable to verbalize your doubt, wishing she would have pressed just a little bit harder? 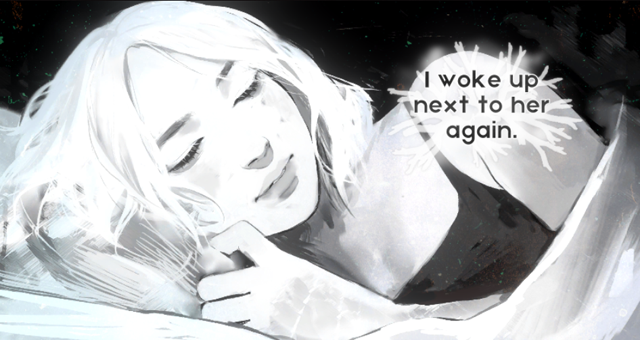 I Woke Up Next to You Again branches into multiple endings and vividly renders a complex theme of addiction through the metaphor of a relationship. Inspired by pieces like Air Pressure, it explores a difficult theme from an unconventional angle, drenched in symbolism. Do you pull away, do you give in, do you deny it all even as it fades out of your life? Although a bit repetitive, it is indeed worthwhile to explore the different perspectives of the story and piece it together. And as you do, take time to absorb the dystopian atmosphere of the cityscape. It does play as a rather short experience, but the presentation offers a powerful message and firmly conveys the point for the amount that it has. 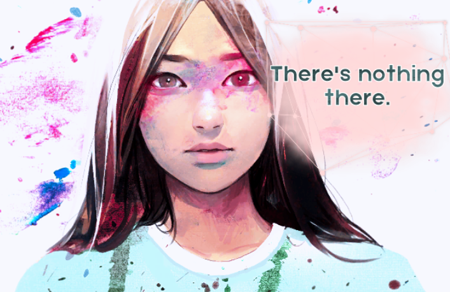 In that way zephyo shows us that sometimes you don't need too many words to illustrate something profound. The game can be played either with the mouse or using the keyboard. [WASD] or the arrow keys can be used to navigate between different choices offered at various points, [Enter] confirms it, and [Esc] pauses the game. The adventure is short and sweet though, so it's probably safe for me to say that you can finish it in one night. Pretty easy to play through and get all four endings. It should be noted that unless otherwise stated, none of the other choices really matter. Selecting (Tri) here will get you this ending. Basically, your character shuts down meeting new people, and doesn't really grow as a person. Your character needs to effectively call the other person - this first means that you either need to give your number to the other person or get their number when they plead you. Then, you either need to call the other person or you don't call but decide to call tomorrow. Your character gets so addicted that the screen screws up big time, your character stops listening to others around them, and just think about the other person all the time. Your character needs to meet the other person again, but end the relationship completely. This can be achieved by a variety of options - either holding your ground, not getting the other person's number, or promising to never call the other person if you do get their number. This choice will decide which ending you get. Your character can either pretend that everything is fine, or your character may admit that there might be something wrong. How or why this changes the ending is a bigger spoiler. This is because your character meets one of their old friends that happened to start in the field of therapy. Hiding your condition from this person makes things relapse, while admitting that something might be wrong allows this person to help your character through this difficult moment. The metaphor seems a bit... heavy sometimes, but it works.